They may be lumbering, but these powerful war machines of the Death Guard are all the more devastating for their opponents. Their horrific plagueburst mortars have a range as dangerous as the deadly clouds of corrosive spores coming from their projectiles. Whoever manages to get close enough to the Crawler will be rewarded with a spray of diseased slime. Even if the Crawlers have a massive resilience in battle, the models are not quite as insensitive. 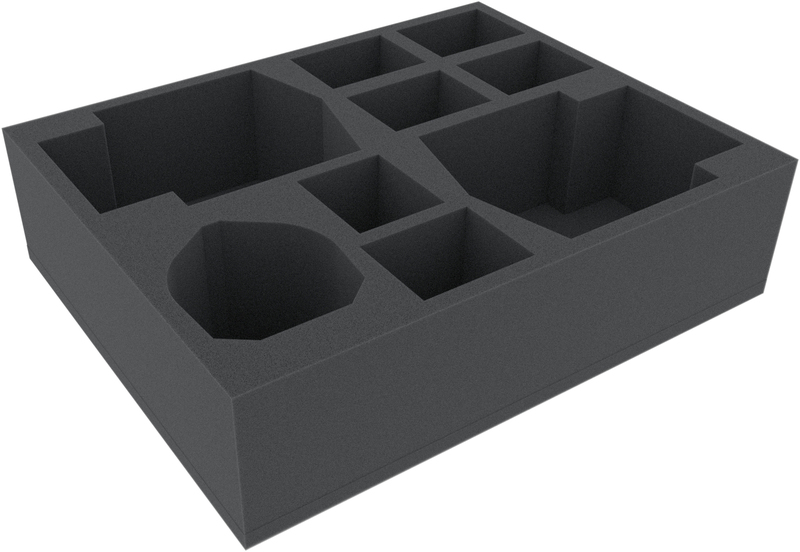 This Full-Size foam tray provides the optimum protection for your Plagueburst Crawlers. The mat offers a safe space for 2 Death Guard siege tanks with tailor-made compartments. Separate storage on the soft foam mats prevents damage to sensitive parts such as the spikes on the dozer blade. In addition to the two compartments for the Death Guard tanks, a miniature-precise cut compartment for the Myphitic Blight-hauler ensures that multimelter and rocket launchers will continue to fire for the Death Guard. 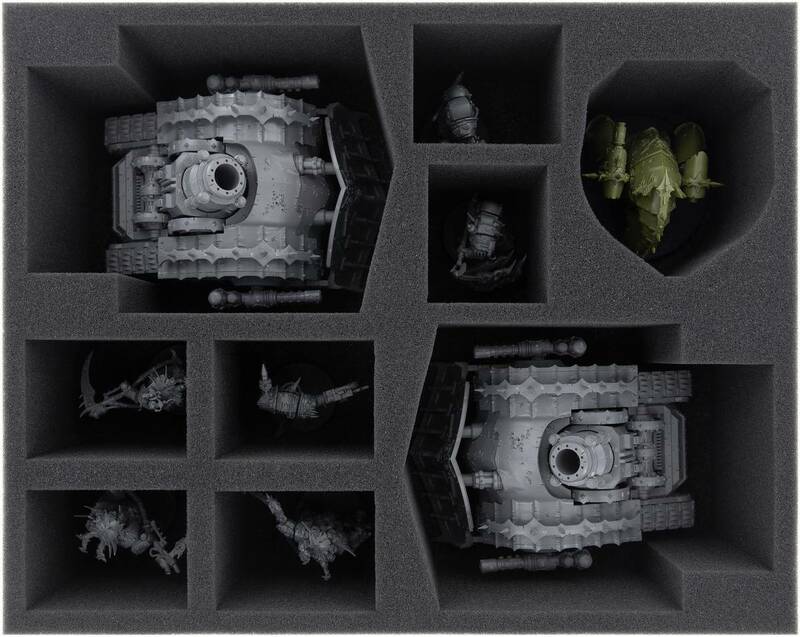 The storage of the Death Guard war machines in precisely fitting compartments not only protects the sensitive parts, it also prevents the models from slipping and colliding during transport. This can cause the colors to flake off, which can be very annoying especially with these models, after spending a lot of time and effort in painting. 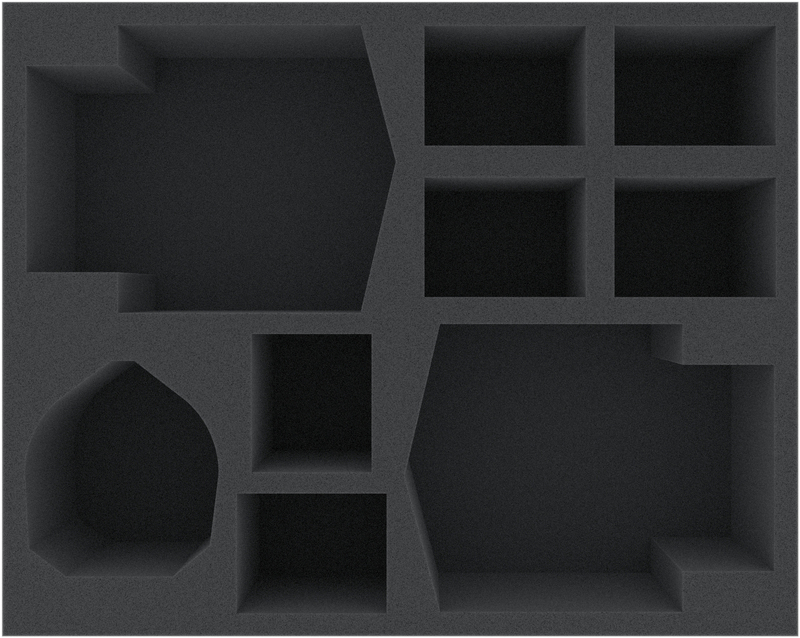 Additional 6 compartments can be filled with figures of your choice. They are suitable for most Death Guard warrior models, such as the Deathshroud Bodyguards, Poxwalker or Plague Marines.